Thanks to my pumpkin chocolate chip muffin recipe my whole house smells like autumn. Yum! It’s finally fall – even here in the South where fall seems to come a little later each year. That means, in addition to the fantastic fall foliage and wonderful weather we can once again enjoy fantastic fall food. Hearty chili, creamy potato soup, easy slow cooker roast, pork chops with fried apples, quinoa-stuffed roasted acorn squash and butternut squash soup will be appearing on my meal planner over the coming weeks. 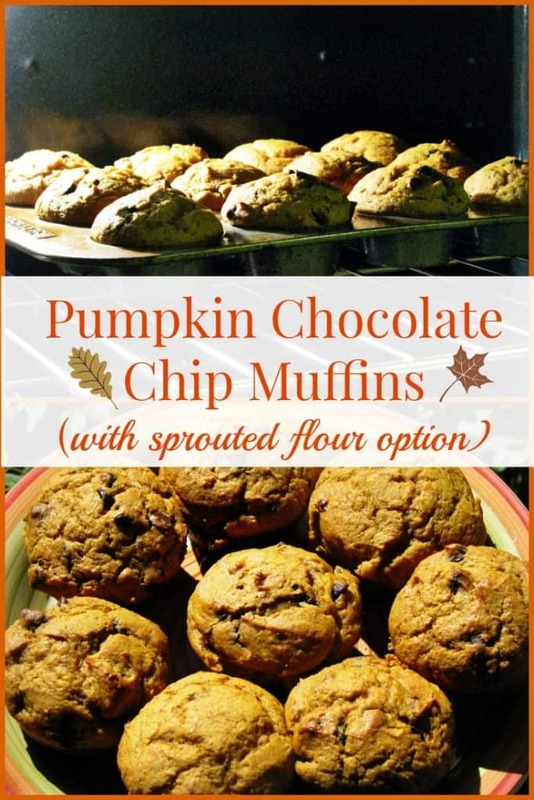 Today, I’m sharing my recipe for the perfect Pumpkin Chocolate Chip Muffins. These muffins are dense, moist and rich – in addition to being addictive (don’t say I didn’t warn you!) They bring to mind the taste of grandma’s pumpkin pie with a pop of dark chocolate in just the right places. I love them, my kids love them and I usually bake at least a double batch to freeze. These pumpkin chocolate chip muffins make a great on-the-go breakfast when we have to leave the house early to travel for soccer games. They are as filling as they are delicious. Although the recipe is for a dozen regular sized muffins, you could also make mini muffins for a fun sized treat. Or, if you care about your caloric intake. Or, whatever. If you’d prefer gluten-free pumpkin chocolate chip muffins, I have a little secret that you’ll love. Last spring I discovered Bob’s Red Mill 1-to-1 Gluten Free Flour mix . It’s easy to use because you don’t have to worry about substitution measurements. Just use it as you would regular flour in your recipes.We love it in our baked goods. If you’re not looking for a gluten free recipe but you want to use a flour that is more nutritious than conventional all-purpose or hard-to-digest whole wheat, try sprouted flour. You can make homemade sprouted wheat flour yourself or buy my favorite brand of sprouted flour . Combine flour, sugar, salt, baking soda, baking powder, and pumpkin pie spice. In a separate bowl combine the eggs, vanilla, melted butter and canned pumpkin. Make a well in the center of the flour mixture and place the pumpkin mixture in it. Stir until just moistened. Line the cups of a muffin tin with paper liners or grease with butter. Bake the muffins for 25 minutes or until a toothpick inserted into the center of a muffin comes out clean. For mini-muffins, start with 10 minutes and add 2 minutes until they are done.